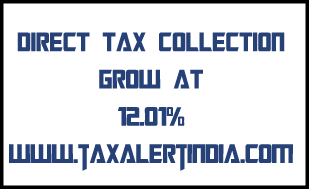 The figures for Direct Tax collections up to December, 2016 show that revenue net of refunds is Rs. 5.53 lakh crore which is 12.01% more than the net collections for the corresponding period last year. This collection is 65.3% of the total Budget Estimates of Direct Taxes for Financial Year 2016-17. As regards the growth rates for Corporate Income Tax (CIT) and Personal Income Tax (PIT), in terms of gross revenue, the growth rate under CIT is 10.7% while that under PIT (including STT) is 21.7%. However, after adjusting for refunds, the net growth in CIT collections is 4.4% while that in PIT collections is 24.6%. Refunds amounting to Rs.1,26,371 crore have been issued during April December, 2016, which is 30.5% higher than the refunds issued during the corresponding period last year. After accounting for the third instalment of advance tax received in December, 2016, the collections under advance tax stand at Rs.2.82 lakh crore, which is 14.4% higher than the figures for the corresponding period last year. Corporate advance tax is growing at 10.6% while Personal advance tax has registered a growth of 38.2%.